You ask! I listen! I heard your many requests across all the social media sites that I visit regularly & on my website to please break it down with a list of my absolute must haves from It Cosmetics website so here it is all in one spot because I love you & I don’t want you to fret, which by the way only causes wrinkles! Limited Edition, Exclusive Set w/Celebration Foundation & my absolute fave double ended Airbrush Brush. It’s a ridiculously good deal. Just get it for the brush alone which retails for $48!!! This brush is seriously the closest thing to a magic wand! Vitality Face Disc. If you have a face you need this! Matte Bronzer on one half, blush & highlighter with wearable shimmer on the other. Bye Bye Undereye Concealer which can also be used as a foundation & to contour/highlight. Waterproof/Workout Proof/Sweat Proof too and what I used on the cast in Turbo Fire and Chalene Johnson in the upcoming PiYo videos! Pretty Natural Eyeshadow Palette, all creamy wearable matte colors that work especially great on camera plus a magic transformer color that converts each shade into a shimmer so you get double the colors! CC+ Cream, this is what you use to achieve that gorgeous skin that looks perfectly natural yet build-able to full coverage & protected by the sun with SPF 55+! That’s the smartest defense against premature aging all while looking perfectly polished!!! Feel the Moment primer/hydrate/spa in a bottle that smells luxuriously blissful! ByeBye Pores Setting powder. If it’s wet, you must set. Use over any liquid or cream product so it lasts all day without transferring & powder products blend perfectly on top. Brow Power waterproof brow pencil. Hot yoga proof! Waterproof gel automatic eye liner pencil. The black is the blackest most opaque black EVER!! Great for the waterline! FYI, there’s a secret sharpener on the back to help keep a very fine point on the tip for all of you cat eye, wing loving ladies! The pencil itself is automatic so you won’t sharpen away 50% of your product like you would with a traditional wood type pencil! Hydrating lip gloss stain (lipsticks are amazing too!!) all the shades are gorgeous & the stain really leaves color on lips without drying out your pucker!! The brushes! OMG! The Brushes!! They don’t shed & better than even my $60 Marc Jacob’s brushes! Double ended airbrush, angled blush & ball bunny tail powder brush are my faves!! I hope this helps my beauties!! Thanks so much for coming back to my blog! I promise to update more often. Until then you know where to find me on Instagram FaceBook and this weekend i’m shooting my first makeup tutorial videos! You can get them for FREE as long as you are on my VIP List. Just go to the Home Page on my website Coach Glitter and add your name & email if you haven’t already! I have so much more to share! Coming soon!! Hi Tiffany, you’ve done amazing branding, makeup and hair for Chalene Johnson. Now I would like to learn how to look that gorgeous in my organizing videos. What makeup do I use for camera? 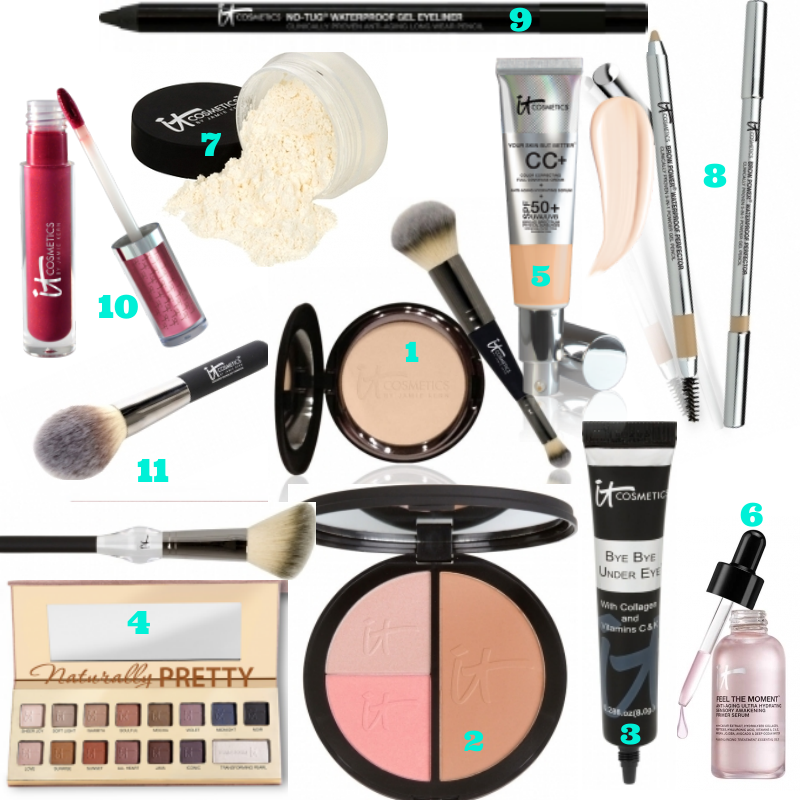 These are all the products I use professionally in my pro kit and also personally. All of these work beautifully on camera. My makeup tutorial videos shows how to use a few of the products in various, multi-tasking ways!